Regular Eye readers will know our enthusiasm for St Bride Library, which opened 123 years ago today. It’s where we hold our quarterly Type Tuesday events (the next event – ‘Max Gill and maps’ – is on 4 December) whose proceeds help support the St Bride Foundation. 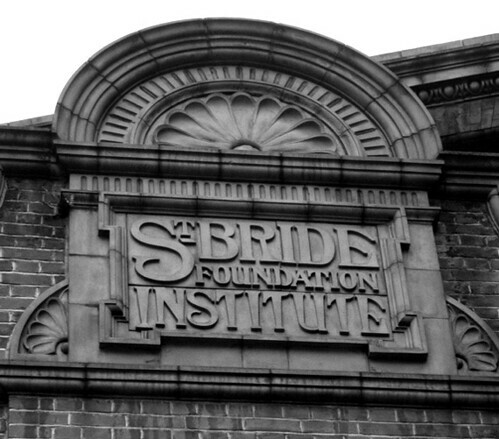 The façade of St Bride Foundation. Top: Five Line Pica Roman, as cut by Hugh Hughes for the Caslon and Catherwood type foundry, ca. 1805. Courtesy St Bride Library, London. 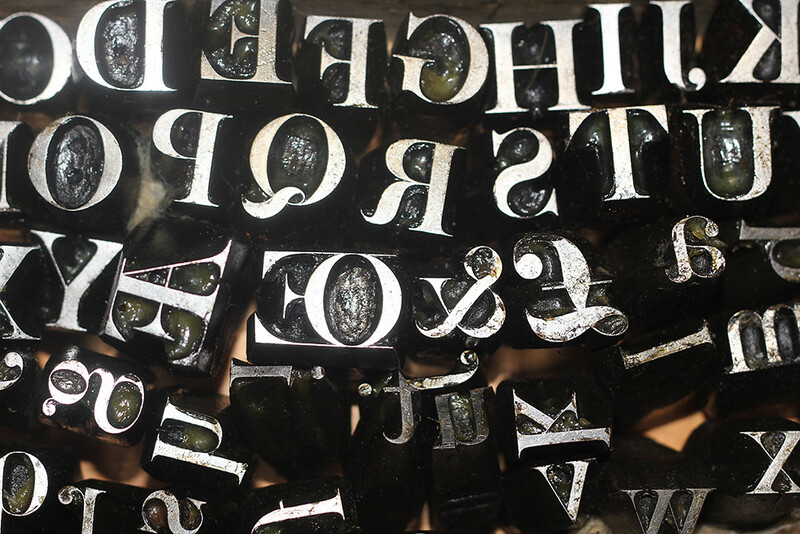 The Foundation runs the library and is responsible for its extensive archive of books about type and printing, plus equipment, punches, wood and metal type, specimen books, journals and design artefacts of all kinds, some of them stored off-site. It also rents out the halls and various rooms to outside clients for meetings, conferences, weddings, etc. Within the sprawling buildings, tucked away between Fleet Street and Blackfriars Road, are further storerooms, a bindery, cellar bar, a theatre that regularly hosts productions by fringe theatre groups and printing workshops. 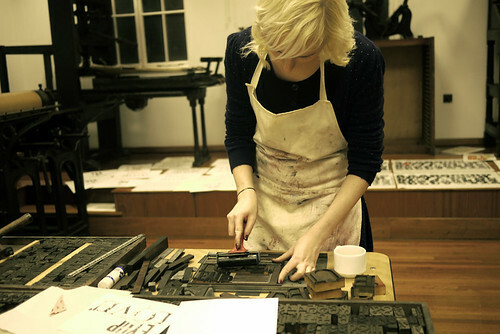 A printing workshop at St Bride. For many years the librarian was James Mosley (see Paul Barnes’s ‘A life in objects’ in Eye 90), whose keen eye and sense of historical perspective informed the quality of the St Bride collections. Mosley succeeded W. Turner Berry as librarian in 1958 and retired in 2000, succeeded by his former assistant Nigel Roche. Since Roche resigned in 2012, the library has been without a librarian, relying on temporary appointments and volunteers to keep it open on an irregular basis. A few years ago, the threat of the library closing its doors caused ripples of concern among the design community, but as long as Eye magazine has existed, there has been some sort of crisis hovering around St Bride – see Robin Kinross’s ‘Temple of type’ in Eye no. 2. Thanks to the support of part-time staff and volunteers, the Library is now open twice a month, and the management has reinstated the Friends of St Bride scheme, which co-ordinates financial, moral and practical support across the design and printing industries. The missing element in St Bride’s return to its former typographic health and glory is a librarian who can take charge of this sprawling archive and re-assert its relevance within the contemporary world of type and design. In the first sentence, the job ad rather predictably asks for someone with ‘passion for the printed word’. Fortunately it goes on to detail the enormous intellectual and curatorial challenge facing the new librarian, which include ‘developing a clear profile for future contents of Library’ and ‘being an ambassador for the Library’. St Bride’s treasure trove of research material – hundreds of thousands of artefacts – is rooted in half a millennium of printing. But its value also lies in the collection’s continued relevance to design and communication in the present century, and the type we read on every possible surface, from the smartphone in your pocket to the billboard on the roadside. It’s a big job, which requires someone with the vision, deep knowledge and tenacity to secure St Bride’s future and protect its incomparable past. Could that be you? 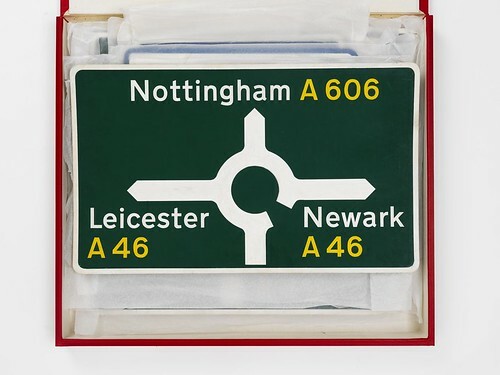 Handmade maquette for ‘all-purpose’ primary route sign for Britain’s national road signing system. Designed by Jock Kinneir and Margaret Calvert, ca. 1962. Kinneir donated several such maquettes to St Bride Library in the late 1970s (see ‘A design (to sign roads by)’ in Eye 34). Image courtesy of St. Brides / Henrik Kubel.